The Golden Oldie is 1.1 MB. Larger files take longer to load. 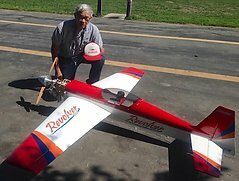 Fred Reese is a very prolific sport model designer who created many model designs kitted by House of Balsa and Ace, among others. 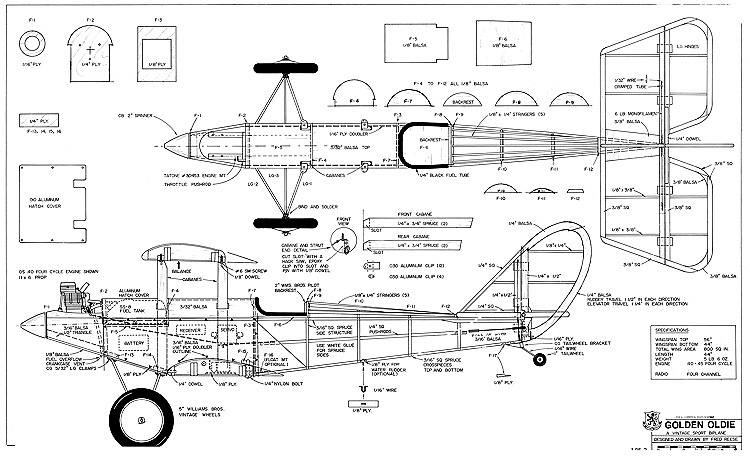 His 56" span Golden Oldie is a sport biplane designed for .40 CID four-stroke engines, an OS 40 4-cycle engine is shown on the plans. The appearance was deliberately chosen to emulate the looks of several general aviation aircraft of the 30s and 40s. In my mind, the Golden Oldie kinda looks like a biplane Pietenpol (a model that Fred designed for House of Balsa). The Golden Oldie's performance is deliberately set to be slow and graceful, the plane capable of intermediate aerobatics with a suitable engine and propeller combination. The Golden Oldie would be an excellent candidate for a brushless out-runner electric propulsion system in the 500-800 watt class. As is true for all biplane models, the builder should take care to align both wings incidences to a fuselage reference line using commercially available alignment systems. If you need to resize a plan please contact us with the ID:97971 and the desired wingspan. I will calculate a price upon request, please contact me here mentioning this PlanID: 97971 and the job you wish me to do. This plan is 1.1 MB and was shared by our member aeroastro on 13/01/2017 16:15 in the RCM Plans category.